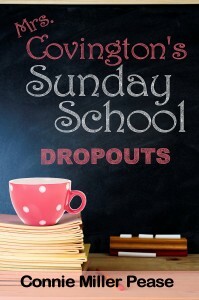 Cathy Covington has taught Sunday school to hundreds of young teens over the last forty years. After graduation, many of those students walked out the church door without a backward glance. Now Cathy is determined to see if a little nudge could push some of them back on the straight and narrow. But when Cathy is elected Chairman of the Lumberjack Days parade committee, her new post threatens to consume all her time and energy. And, as if life isn’t crazy enough, she stumbles on a windfall that could change everything in her life. What follows is a hilarious, heartwarming adventure through the state forest, suburbs, and inner city as Cathy and her cousin Andi track down her former students, now troubled young adults. Along the way, Cathy learns that blessings have a way of hiding themselves until you are miles down the road, looking in the rear view mirror. I’ve (along with my husband) have taught Sunday School for nearly thirty years. Like the character in my book, I have on occasion followed up on some of my former students. Sometimes we begin life headed in one direction and experiences or friends take us in another. It is unfortunate that many people have a skewed idea of the Christian life. They’ve met folks who lived it poorly or have heard or read things about it that are in error. True Christianity is wonderful and it’s worth the effort to remind those who knew it and forgot. Some of the things the main character does are lifted from my own teaching and embellished. I have some dear memories of cousins growing up and I wanted to use that kind of relationship in my story.